Can You Find The Perfect Poker Hand? Can You Shut This Infernal Box? Which two-card starting hand is the most likely to make the nuts once the board has been dealt? You win if you close all of the numbers before you run out of legal moves — that is, if you can’t shut numbers that add up to your dice count. If you play perfectly, what are your odds of successfully “shutting the box”? Congratulations to 👏 Matthew Bishop 👏 of Orlando, Florida, winner of last week’s Riddler Express! Last week, terror loomed. The year was 2000, and an arithmetical anarchist group had an idea. For the next 100 years, it would vandalize a famous landmark whenever the last two digits of the year (for example, this year is “18”) was the product of the month and date (i.e. when month × date = year, in the MM/DD/YY format). How many attacks will happen between the beginning of 2001 and the end of 2099? What year will see the most vandalism? The least? What will be the longest gap between attacks? 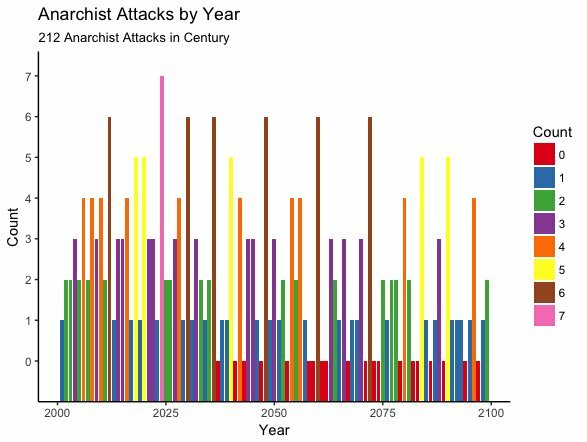 There will be 212 attacks during the century. The year 2024 will see the most vandalism, with seven attacks. Several years will see no vandalism. The longest gap between attacks will be 1,096 days. There’s no real trick to this problem — it’s just a matter of carefully accounting the anarchic century ahead. A computer probably came in handy. Nick Holt solved the problem in R; Mark Fischer in Python; and William Stefanko in a Google spreadsheet. But there is some intuitiveness to the answers. The year 2024 is especially dangerous because the number 24 has so many factors: 1, 2, 3, 4, 6, 8, 12 and 24. This yields lots of valid date-and-month combinations that multiply to the year 24: 1/24, 2/12, 3/8, 4/6, 6/4, 8/3 and 12/2. For the same reason, years like 2012, 2020 and 2036, with a lot of factors of their own, are also dangerous. The years with no attacks are larger prime-number years, such as 2037. Prime numbers have no factors other than 1 and themselves, and dates never get any bigger than 31, so the anarchists’ multiplication problem will never be satisfied in those years. Be careful out there, Riddler Nation. Congratulations to 👏 Tiago Batalhão 👏 of Singapore, winner of last week’s Riddler Classic! Early last week, Villanova won the men’s college basketball national title. The few teams that beat Villanova this season — Butler, St. John’s, Providence and Creighton — can therefore claim the dubious title of “transitive national champion.” And so too could the teams that beat those teams, and the teams that beat the teams that beat those teams, and so on. How many transitive national champions were there this season? Or, maybe more descriptively, how many teams weren’t transitive national champions? Of the teams that played in the thousands of basketball games listed here, 1,185 (including Villanova) could claim a transitive title. Only a relatively few — 177 teams — could not. The chains of wins required to justify the claims to a transitive title ranged from zero (Villanova itself) to 13. Congratulations to, among hundreds of other teams, the Albany College of Pharmacy and Health Sciences: your 2017-18 transitive national champs! That school beat Alfred State, which beat John Jay, which beat Elmira, which beat Oswego, which beat SUNY Oneonta, which beat Roanoke, which beat Lynchburg, which beat Norfolk State, which beat Stony Brook, which beat Rutgers, which beat Seton Hall, which beat Butler, which beat Villanova! Phew. The games included in the analyses above include some teams not even in the highest echelons of college basketball — that is, not in NCAA Division I and, in some cases, not in the NCAA at all. Ferris State, for example, plays in Division II, and Albany Pharmacy plays in the USCAA. But when we focus just on the highest tier, we find something even more surprising (to me, anyway): Every single Division I men’s basketball program — all 351 of them — could rightfully claim a transitive national championship this season. That’s a lot of nets that need cutting down. 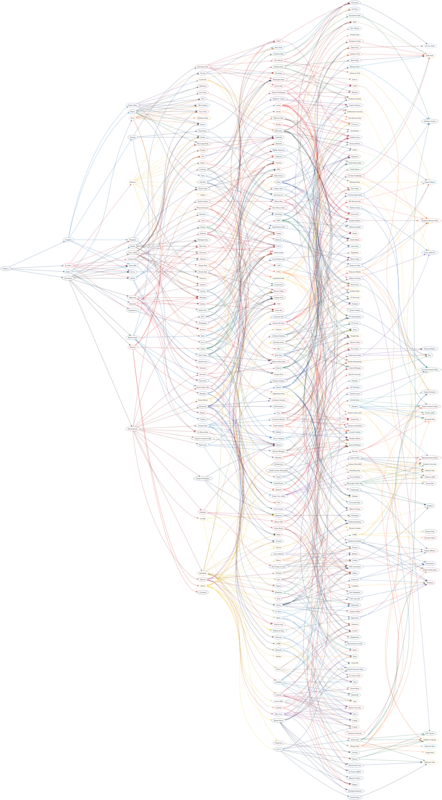 Solver Allen Jarvis mapped the intricate web of D-I college basketball, from Villanova on the far left to teams with longer strings needed, including Houston Baptist, Eastern Kentucky and Savannah State, on the far right. (The arrows point to the team that beat the connected team.) 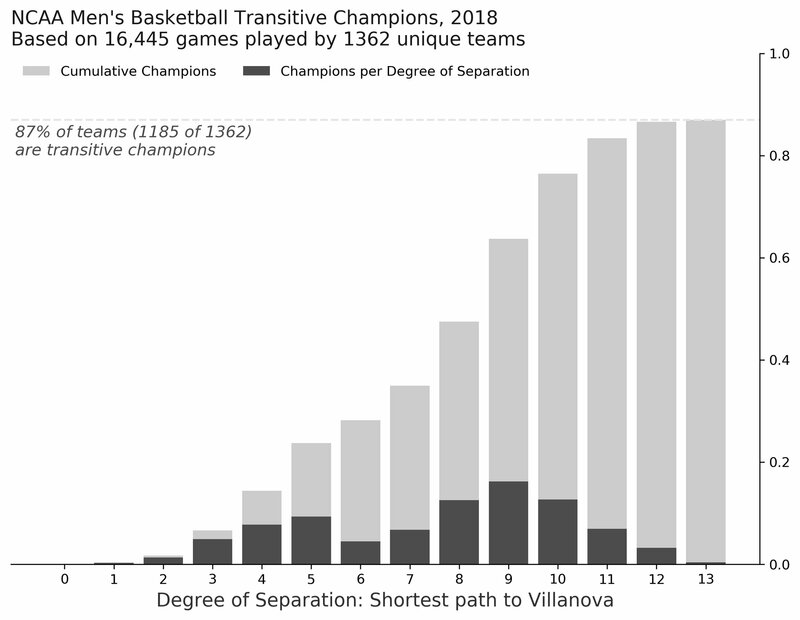 This graph is fully connected, implying that every school could have claimed a transitive title regardless of who the real champion wound up being.